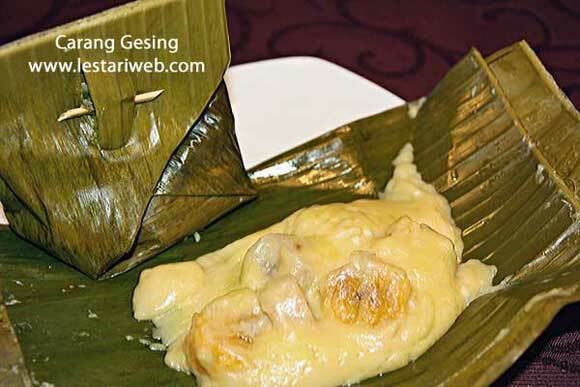 Here it is the special dish from Jogjakarta : Carang Gesing, a dessert which maded from Banana, wrapped and steamed also in Banana leaf. This light dish is one of my family's favourites, included my parent in-laws. Anyway ..I have accrossed this dish when we were visiting my cousin's in-law in Jogja. Once we arrived, the host alias Luci's mother greeted us along with Carang Gesing which's just shortly cooked. It means..it's still hot and with banana leaf's fragrant spreading arround the room. Hmmmm ..what an Asian temptation!! Without hesitation, my husband grabbed quickly what he later call "exotic delicacies". He had even finished 2 pcs at once!! ;-)). Falling in love at the first time, he didn't waste the time and told me to ask the host lady how to make & prepare this dish. To make it short...this sweet dish has been a favourite ever since. In fact I'm proud to serve this dessert to make lovely dinner for family members and close fiends. Are you curious? It's worth trying though! The cooking process is quite simple & easy. But the taste?? .. hmmm it's simply delicious!!. Note: For those who live in western countries, there may be problem to get a banana leaf, because this item is not available in all Asian stores. As solution use Aluminium-Foil as a subtitude. Of course alu-foil can not replace the fragrant of banana leaves. If necessary you can just put the batter into ramekins then steam or put into the microwave until the batter getting hard (about 5 minutes) Last but not least ... Thanks & Credit goes to Lucia Indarwati for sharing this recipe ..
Peel-off bananas and cut about 1 cm thick. Mix the sugar, coconut milk & vanilla flavor instant Pudding in a bowl. 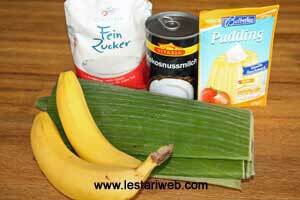 Add the sliced banana. Add salt to taste and adjust the seasoning. Mix well. Put 2 tbs of the mixture in the middle of banana leaf, then wrap it properly. Steam it for 30 minutes until the batter well cooked. (Otherwise see the above Tips & Trick in case of using Pyrex /Ceramic glass). Serve warm or cold.